Continuing Nursing Education Objectives and instructions for completing the evaluation can be found on page 171.
ain management is a very important aspect of nursing care of the pediatric patient. According to the International Association for the Study of Pain (IASP), Special Interest Group on Pain in Childhood (2005), pain relief is a human right. Since 2001, pain management standards require that providers be educated in the assessment and management of pain, and that they recognize the right of patients to appropriate assessment and management of pain (Joint Commission of Accreditation of Healthcare Organizations, 1999; The Joint Commission, 2011). Pain is a subjective experience and can only be judged by the patient experiencing it (McCaffrey & Pasero, 1999). Pain in children is a subjective experience that “has sensory, emotional, cognitive, and behavioral components that are interrelated with environmental, developmental, sociocultural, and contextual factors,” and is often considered inadequately assessed and undertreated (American Academy of Pediatrics [AAP] & American Pain Society [APS], 2001, p. 793). The role of the nurse in pain management encompasses the entire nursing process. The nurse assesses for the presence of pain, plans pharmacological and non-pharmacological pain management strategies with the medical team, implements the plan, and evaluates the effectiveness of the interventions (American Nurses Association [ANA], 2001). Mercedes Stanley, BSN, RN, is a Pediatric Staff Nurse, Novant Health, Hemby Children’s Hospital, Charlotte, NC. Deborah Pollard, PhD, RNC, CNE, is Associate Professor, University of North Carolina Wilmington, Wilmington, NC. Statements of Disclosure: Please see page 171 for statements of disclosure. Pain management is a very important aspect of nursing care of the pediatric patient. A nurse’s knowledge and attitude can affect his or her ability to adequately provide pediatric pain management. This study examined the level of knowledge of pediatric pain management, the attitudes of nurses, and the level of selfefficacy of pediatric nurses in acute care. In addition, the relationship between the years of experience and the levels of knowledge, attitudes, and self-efficacy were examined. A cross-sectional, correlational design was used in a convenience, non-probability sample of 25 pediatric nurses. Nurses volunteering to participate in the study were asked to complete two instruments: Pediatric Nurses’ Knowledge and Attitudes Survey Regarding Pain (PNKAS-Shriners Revision) (Manworren, 2000, 2001) and Nurses’ Self-Efficacy in Managing Children’s Pain (Chiang, Chen, & Huang, 2006). There was no statistically significant relationship between knowledge and self-efficacy (r = 0.039, p = 0.853) or knowledge and years of nursing experience (r = 0.050, p = 0.822). There was a statistically significant relationship between the level of knowledge and the years of pediatric experience (r = 0.404, p = 0.05) and knowledge and the membership in a professional nursing organization (t = 4.050, p = 0.004). Years of pediatric nursing experience correlated with significantly higher knowledge levels, as did a membership in a professional nursing organization. Further, education may benefit pediatric nurses in regard to their management of pediatric pain. Research is needed to examine the effects of self-efficacy on pediatric pain management and how it relates to the level of knowledge. ry depression and addictions. The researchers go on to say that the health care team’s personal values and beliefs about the meaning and value of pain greatly affect the use of pain treatments. For example, 55% to 90% of nurses believe that children overreport their pain (Manworren, 2000). The purpose of this study was to examine the level of knowledge of pediatric pain management, the attitudes of nurses, and the level of selfefficacy of a group of pediatric nurses in North Carolina. Relationship Between Knowledge, Attitudes, and Self-Efficacy of Nurses in the Management of Pediatric Pain fidence in that it is much more specific, and it changes more quickly. Further, just because one’s self-efficacy is high in one area does not mean that it is high in every area (Heslin & Klehe, 2006). According to Bandura (1994), selfefficacy is affected through four main psychological processes: cognitive, motivational, affective, and selection. These processes shape a person’s view of their abilities and efficacy. There are three central sources of self-efficacy: enactive self-mastery, role-modeling, and verbal persuasion. Enactive self-mastery is by far the most powerful source of gaining or losing self-efficacy and is experienced through situations that provide many opportunities to succeed and few opportunities to fail (Heslin & Klehe, 2006). For example, regarding pediatric pain management, a new pediatric nurse would be given the ability to assess and treat pain under the instruction of an experienced nurse multiple times before ever assessing or treating the pain on his or her own. Role-modeling would be experienced by watching the practiced nurse give pain medications on a regular basis. This allows novices to picture themselves in the situation and to visualize being successful. From this source, it is important that the role-model be willing to accept setback as a normal part of learning and continue to be persistent in the development of skill. Verbal persuasion is mixed between positive self-talk and words of encouragement and praise from managers and others who have the ability to approve of skill (Heslin & Klehe, 2006). In this study, the relationship between knowledge and self-efficacy was examined. By receiving coaching and by participating in pain management, nurses should have gained knowledge through enactive self-mastery. Based on Bandura’s Social Cognitive Learning Theory, increased knowledge should play a role in increased self-efficacy for these nurses. els of pain. The nurse must be aware of the different methods to evaluate pain: physiologic, self-report, behavioral, and parent input (Merkel & Malviya, 2000). Physiologic indicators of acute pain include an increase in heart rate, blood pressure, or respirations. Numerous self-report tools are available for almost every age group and level of development. Because self-report is considered the golden standard for pain assessment, it is necessary that it be obtained as much as possible and that there are reliable tools to measure it (Merkel & Malviya, 2000). Tools available for self-report include Hester’s Poker Chip tool, the Oucher Scale, the Wong-Baker FACES Scale, the Visual Analog Scale (VAS), and the Finger Span Scale. When selfreport is not attainable, the nurse should use a behavioral scale. This is more often used for preterm and fullterm infants who are unable to communicate. The Face, Legs, Activity, Cry, and Consolability (FLACC) Scale, the Premature Infant Pain Profile (PIPP), the Toddler-Preschooler Pain Scale (TPPPS), and the Preverbal, Early Verbal Pediatric Pain Scale (PEPPS) are all behavior tools that have shown effectiveness in behavioral pain assessment. Lastly, asking the parents of the child the usual pain responses of their child may be beneficial. Each method has strengths and weaknesses, and it is important that the nurse uses them in conjunction with each other (Merkel & Malviya, 2000). Although numerous reliable tools are available for nurses to use in pediatric pain management, many nurses do not use them. In a study performed by Simons and MacDonald (2004), nurses’ views were explored concerning children’s pain tools. The researchers found that even though these nurses were treating pain, they did not necessarily use any pain tool. The nurses felt they were not knowledgeable enough about the tools to use them properly. They believed proper instruction on the tools would not only aid in their care of the child in pain, but it would also help in their documentation (Simons & MacDonald, 2004). atric pain (Vincent, 2007). Other findings conclude that even though much importance is attributed to correct pain management, it is not enough to motivate nurses to improve in this area. Because many nurses know that some pain should be expected in many situations, it is not abnormal for a child to report a certain level of pain. This study urges the importance of exploring nurses’ attitudes and beliefs toward pediatric pain management (Twycross, 2008). A qualitative study of 21 nurses concluded that a barrier to pain management is a lack of education about pain assessment. Nurses reported that if they were better prepared and understood children’s pain behavior better, they would be able to manage it more effectively (Gimbler-Berglund, Ljusegren, & Enskär, 2008). Not only are nurses often undereducated on pain management, Rieman and Gordon (2007) identified that those who are educated do not consistently carry out proper pain management techniques. In a study of 295 registered nurses (RNs), a weakness most nurses reported was the understanding of pharmacology and its effects on the respiratory system. Specifically, many nurses reported a fear of respiratory depression in their pediatric patients (Rieman & Gordan, 2007). The AAP and APS (2001) concur that even though there is sufficient knowledge supporting the correct ways to treat pediatric pain, it is not universally applied. In opposing literature, a descriptive study by Griffin, Polit, and Byrne (2008) surveyed a convenience sample of 334 registered nurses in the United States and concluded that appropriate treatment is generally given to pediatric patients. The authors of the study clarify that the surveys consisted of vignettes and did not necessarily accurately portray the clinical setting. They identified overall barriers as nurses’ attitudes toward pain management, the lack of knowledge, and the lack of a universally applied method for pain assessment and management. In addition, barriers related to work security, time constraints, inconsistencies in practice, and perceived lack of power by nurses may impact their ability to promote effective pain management (Ellis et al., 2007; Ely, 2001). been shown to affect patient outcomes by potentially increasing hospital length of stay and delaying recovery (Schechter, Berde, & Yaster, 2003); thus, the management of pain has major implications for nursing. A nurse’s knowledge and attitude can affect his or her ability to adequately provide pediatric pain management. In one study by Rieman and Gordon (2007), although the level of knowledge of pediatric pain management did not differ significantly based on education preparation, nurses with more than two years of experience or who participated in continuing education courses had significantly higher knowledge and attitude scores regarding pediatric pain management. Schechter (2008) noted that even in nurses with the best intentions, gradual erosion of the level of attention to pain is often inevitable in the face of increasing patient volume, frequent understaffing, and continued resource limitations. Faced with these challenges, it is important to identify the knowledge, attitudes, and confidence of pediatric staff and address these barriers through planned educational activities. Without an acknowledgement of ownership in each nurse, any pain management technique will not be complete (Schechter, 2008). This review of the research literature demonstrates some common limitations in the literature, such as the use of convenience samples, small samples sizes (less than 20 participants), and an unequal set of demographics. A limited set of studies depicted strengths, including larger sample sizes, national random samples, and pre- and post-test evaluations. Research clearly points toward the importance of correct pediatric pain management. It is imperative that nurses be knowledgeable in the area, and forceful steps should be taken to remove barriers in the clinical setting. Although studies have noted that knowledge and attitudes may affect pediatric pain management, the relationship between the two and selfefficacy has not been examined. nurses in two regional hospitals in North Carolina. Following Institutional Review Board approval, nurses meeting the following inclusion criteria were invited to participate in the study: registered professional nurses and currently employed on a pediatric acute care unit. Nurses volunteering to participate in the study were asked to complete two research instruments: the Pediatric Nurses’ Knowledge and Attitudes Survey Regarding Pain (PNKAS-Shriners Revision) (Manworren, 2000, 2001) and Nurses’ Self-Efficacy in Managing Children’s Pain (Chiang, Chen, & Huang, 2006). Pediatric Nurses’ Knowledge and Attitudes Survey Regarding Pain (PNKASShriners Revision) (Manworren, 2000, 2001). This survey includes 40 questions measuring knowledge and attitudes in managing pediatric pain. The survey has an acceptable level of stability with a test-restest reliability of 0.67 and an acceptable level of internal consistency with a Cronbach’s alpha of 0.72 to 0.77. Content validity was established by five national content experts in pediatric pain (Manworren, 2001). The Cronbach’s alpha for this study was 0.82. Nurses’ Self-Efficacy in Managing Children’s Pain (Chiang et al., 2006). This survey includes six questions addressing self-efficacy in pediatric pain management. The survey has high internal consistency (Cronbach’s alpha 0.88 at pre-test and 0.91 at posttest), and content validity was established by a panel of three pediatric experts (Chiang et al., 2006). The Cronbach’s alpha for this study was 0.81.
strument packets were delivered to staff, and 26 were returned for a return rate of 43.3%. One packet was incomplete, and thus, not used in the statistical analysis. Data Analysis All statistical data were analyzed using the Statistical Package for the Social Sciences (SPSS), Version 18. Descriptive and inferential statistics were used to describe and synthesize the data. Frequencies, percentages, ranges, means, and standard deviations were used for the demographic variables and to describe the scores on the study variables. The Pearson correlation was used to examine any relationships between the study variables. The t-test was used to measure differences between the mean scores on the study variables of level of knowledge and level of self-efficacy to examine any differences between comparison groups. The level of significance set for the study was p < 0.05. Findings Sample Characteristics Twenty-five nurses (N = 25) participated in the study. Thirteen nurses (n = 13) participated from a regional hospital in western North Carolina (Hospital 1) and 12 nurses (n = 12) participated from a regional hospital in southeast North Carolina (Hospital 2). As shown in Table 1, the mean age of the participants was 36.64 years (Range = 22 to 58 years, SD = 9.21). The mean number of years since nursing graduation was 9.39 years. The years of nursing experience averaged 10.17 years, and pediatric nursing experience was 7.92 years. The respondents estimated they spent an average of 59.44% of their time caring for patients in pain. The majority of the participants were female (92%), worked full time (84%), and had an associate degree in nursing (52.4%); others had a bachelor’s degree (42.9%), and one had a diploma in nursing (4.8%). Of the respondents, 56% served on a nursing committee, 12% were a member of a professional nursing organization, and they reported reading an average of 0.67 professional journals monthly. nurses. As shown in Table 2, the total mean of PNKAS was 26 (maximum score = 39), indicating that the participants answered an average of 66.6% of the questions correctly. Between the two groups, nurses at Hospital 1 (n = 13) scored significantly higher on the PNKAS than the nurses at Hospital 2 (n = 12) (t = 2.044, p = 0.05). Research Question 2: Level of Self-Efficacy The Nurses’ Self-Efficacy in Managing Children’s Pain (SET) tool was used to measure the level of self-efficacy of pediatric nurses. As shown in Table 3, the total mean on the SET was 26.28 (maximum score = 30), indicating that overall, the participants had a high level of self-efficacy in regard to pediatric pain management. There was no statistically significant difference between the two groups (t = -1.054, p = 0.303). the years of pediatric nursing experience (r = 0.031, p = 0.885). However, the analysis did show a statistically significant positive relationship between the level of knowledge and the years of pediatric nursing experience (r = 0.404, p = 0.05). Nurses with more years of pediatric experience scored higher on the PNKAS. Note: Due to a tie in numbers, 11 questions are reported here. *There were four questions on this list not reported in the top 10 questions answered correctly by nurses completing the PNKAS Source: Copyright 2002 Shriners Revision. From Rieman & Gordon, 2007. Used with permission. Additional Findings Although not statistically significant, nurses with an associate degree (AD) had a lower knowledge but a higher level of self-efficacy than nurses with a bachelor’s degree (BSN) (t = -1.212, p = 0.245), as shown in Figure 1. In reverse, nurses with a BSN had a higher level of knowledge but a lower level of self-efficacy (t = 1.526, p = 0.150). This may be that increased education allows recognition of knowledge deficits. There was a statistically significant difference between groups of nurses who either participated or who did not participate in professional organizations. Nurses who participated in professional organizations scored higher on the PNKAS (t = 4.050, p = 0.004). As in previous studies, the strengths and weaknesses of the nurses in regard to knowledge of pain management were acknowledged by identifying the top 11 questions answered correctly (see Table 5) and the top 10 questions answered incorrectly (see Table 6) by the nurses who took the PNKAS. A child with background (continuous, persistent) pain has been receiving daily opioid analgesics for 2 months. The doses increased during this time period. Yesterday the child was receiving morphine 20 mg/hour intravenously. Today he has been receiving 25 mg/hour intravenously for 3 hours. The likelihood of the child developing clinically significant respiratory depression is [less than 1%]. *There were three questions on this list not reported in the top ten questions answered incorrectly by nurses completing the PNKAS. Source: Copyright 2002 Shriners Revision. From Rieman & Gordon, 2007. Used with permission. were self-selected and may relate to their interest in pain management. Therefore, those who had little to no interest in pain may not have taken the survey, indicating that the actual level of knowledge may be much lower than what was found. Further, the PNKAS does not correlate to actual clinical practice, and consequently, may not identify actual clinical abilities (Manworren, 2000; Rieman & Gordon, 2007). With the level of knowledge being lower than deemed acceptable by most nursing standards (less than 85%), further research should be conducted to verify these low levels in regard to pediatric pain management. Continued validity of the PNKAS and SET tool is imperative, as is the need for potential other tools used to assess the level of knowledge and the level of self-efficacy. In regard to the level of self-efficacy, it is important that nurses are not overly confident in their abilities to assess and treat pain. Education on pediatric pain management would be suggested for pediatric units. Nurses are continually faced with the challenge of treating pain, and to ensure the best quality of care for patients, nurses need effective knowledge, skills, and attitudes to address pediatric pain needs. To meet nurses’ educational needs, it is essential to provide ongoing education that focuses on their individual needs and is provided in a method of delivery that is receptive to and effective for the practicing nurse. Further research should also focus on the implementation of pediatric pain education programs and their effectiveness. There is a need for continued examination on the effects of self-efficacy in pediatric pain management and how it relates to the level of knowledge. References American Academy of Pediatrics (AAP) & American Pain Society (APS). (2001). The assessment and management of acute pain in infants, children, and adolescents. Pediatrics, 108(3), 793-797. American Nurses Association (ANA). (2001). Code of ethics for nurses, with interpretive statements. Silver Spring, MD: American Nurses Publishing. Bandura, A. (1994). Self-efficacy. In V.S. Ramachaudran (Ed. ), Encyclopedia of human behavior (Vol. 4, pp. 71-81). New York. NY: Academic Press. Chiang, L., Chen, H., & Huang, L. (2006). Student nurses’ knowledge, attitudes, and self-efficacy of children’s pain management: Evaluation of an education program in Taiwan. Journal of Pain and Symptom Management, 32(1), 82-89. Ellis, J., McCleary, L., Blouin, R., Dube, K., Rowley, B., MacNeil, M., & Cooke, C. (2007). Implementing best practice pain management in a pediatric hospital. Journal for Specialists in Pediatric Nursing, 12(4), 264-277. Ely, B. (2001). Pediatric nurses’ pain management practice: Barriers to change. Pediatric Nursing, 27(5), 473-480. Gimbler-Berglund, I., Ljusegren, G., & Enskär, K. (2008). Factors influencing pain management in children. Paediatric Nursing, 20(10), 21-24.
criptions of their experiences with postsurgical pain relieving methods. International Journal of Nursing Studies, 40(1), 33-44. Rieman, M., & Gordon, M. (2007). Pain management competency evidenced by a survey of pediatric nurses’ knowledge and attitudes. Pediatric Nursing, 33(4), 307-312. Schechter, N. (2008). From the ouchless place to comfort central: The evolution of a concept. Pediatrics, 122, S154S160. doi:10.1542/peds.2008-1055h. Schechter, N., Berde, C., & Yaster, M. (2003). Pain in infants, children, and adolescents (2nd ed.). Philadelphia: Lippincott Williams & Wilkins. Simons, J., & MacDonald, L. (2004). Pain assessment tools: Children’s nurses’ views. Journal of Child Health Care, 8(4), 264-278. The Joint Commission. (2011). Facts about pain management. Oakbrook, IL: Author. Retrieved from http://www.jointcommission.org/assets/1/18/pain_management.pdf Twycross, A. (2008). Does the perceived importance of pain management task affect the quality of children’s nurses’ post-operative pain management practices? Journal of Clinical Nursing, 17, 3205-3216. Vincent, C. (2007). Nurses’ perceptions of children’s pain: A pilot study of cognitive representations. Journal of Pain and Symptom Management, 33(3), 290301. Vincent, C., & Denyes, M. (2004). Relieving children’s pain: Nurses’ abilities and analgesic administration practices. Journal of Pediatric Nursing, 19(1), 4050. Walco, G., Cassidy, R., & Schechter, N. (1994). Pain, hurt, and harm. The ethics of pain control in infants and children. New England Journal of Medicine, 331(8), 541-544. To Obtain CNE Contact Hours 1. For those wishing to obtain CNE contact hours, you must read the article and complete the evaluation through Pediatric Nursing’s Web site. Complete your evaluation online and your CNE certificate will be mailed to you. Simply go to www.pediatricnursing.net/ce 2. Evaluations must be completed online by August 31, 2015. Upon completion of the evaluation, a certificate for 1.4 contact hour(s) will be mailed. Goal To provide an overview of knowledge, attitudes, and self-efficacy of nurses and their relationship to the management of pediatric pain. Objectives 1. Explain the importance of pain management in the nursing care of the pediatric patient. 2. Discuss the relationship between the years of nursing experience and the levels of knowledge, attitudes, and selfefficacy in relation to pediatric pain management. Statements of Disclosure: The author reported no actual or potential conflict of interest in relation to this continuing nursing education activity. The Pediatric Nursing Editorial Board members reported no actual or potential conflict of interest in relation to this continuing nursing education activity. This independent study activity is provided by Anthony J. Jannetti, Inc. (AJJ). Anthony J. Jannetti, Inc. is accredited as a provider of continuing nursing education by the American Nurses Credentialing Center's Commission on Accreditation. Anthony J. Jannetti, Inc. is a provider approved by the California Board of Registered Nursing, Provider Number, CEP 5387. Licenses in the state of California must retain this certificate for four years after the CNE activity is completed. This article was reviewed and formatted for contact hour credit by Hazel Dennison, DNP, RN, APNc, CPHQ, CNE, Anthony J. Jannetti Education Director; and Judy A. Rollins, PhD, RN, Pediatric Nursing Editor. 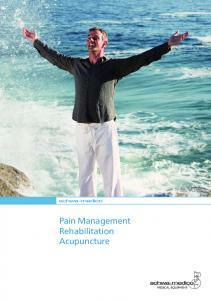 Report "Pain management is a very im -"